Seated Wide Legged Straddle, or Upavistha Konasana, is a seated stretching pose that is recommended for yogis of all levels. Beginners who can’t bring the torso fully forward to the floor are encouraged to put a blanket or bolster in between their legs and allow the torso to rest on that support. Advanced students can ‘help’ themselves gently into a more full forward bend by reaching out to the feet and wrapping the index and middle fingers around the big toes. Bending the elbows, lift them away from the floor allowing the torso to descend toward the floor. Upavistha Konasana is an excellent stretch for the groin, legs and lower back and it is a great way to stretch and release before bed or after sitting for some time. This is an excellent partner pose as well. If partners sit back to back, one can fold forward, and the other can gently rest their back torso on the folded partner allowing the weight and heat from the body to encourage the other. When one partner releases into a seated position, they can reverse the fold to give the other forward encouragement. This is a seated pose that is often done at the beginning or end of a yoga sequence, although it can be practiced alone as well. 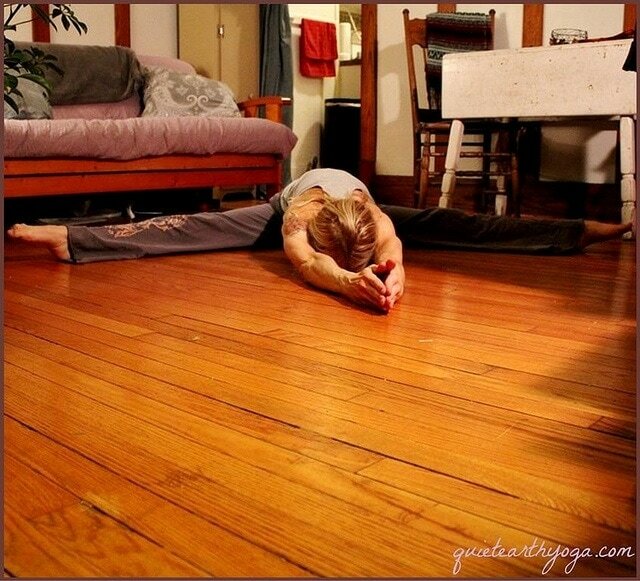 It’s an excellent way to warm up the body, if you are gentle, or a way to deeply stretch if the body is warm. Start from a seated position with your legs stretched out as wide as possible from the hips and toes flexed toward the sky. Keep the thigh muscles engaged, but not clenched, throughout this pose. Press the legs down into the floor and reach the spine long as you fold forward between the legs. When the spine begins to round, hold the forward bend there to keep the back flat. You can reach your hands forward touching the floor keeping your arms long. Keep the kneecaps pointed toward the sky. Release from the pose on an inhale and rise up to seated position. Upavistha Konasana can be quite beneficial to those who practice it regularly, but tough in the beginning so take it slow. It can take many years to master this pose.